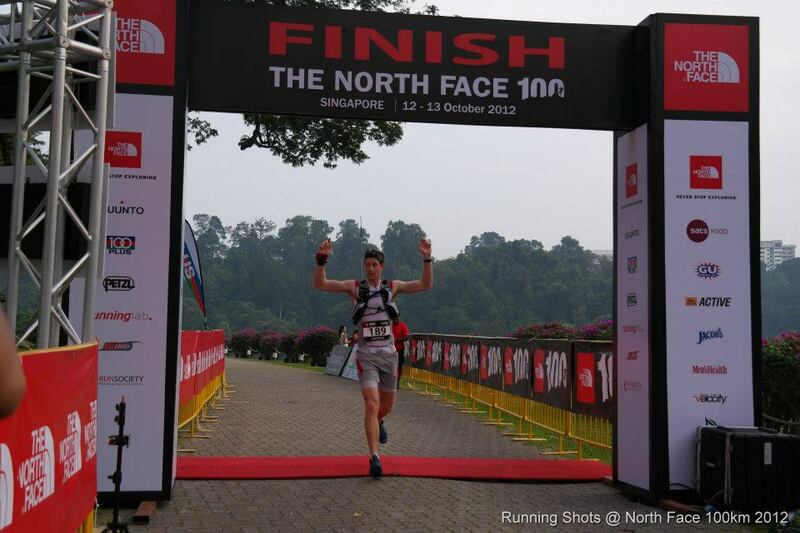 TNF100 Singapore took place four weeks after TMBT (yes, I know .. race report still to come for that one! ), and I was keen to see how the event would turn out given the disappointment it was last year, and if all our feedback had been taken into consideration. 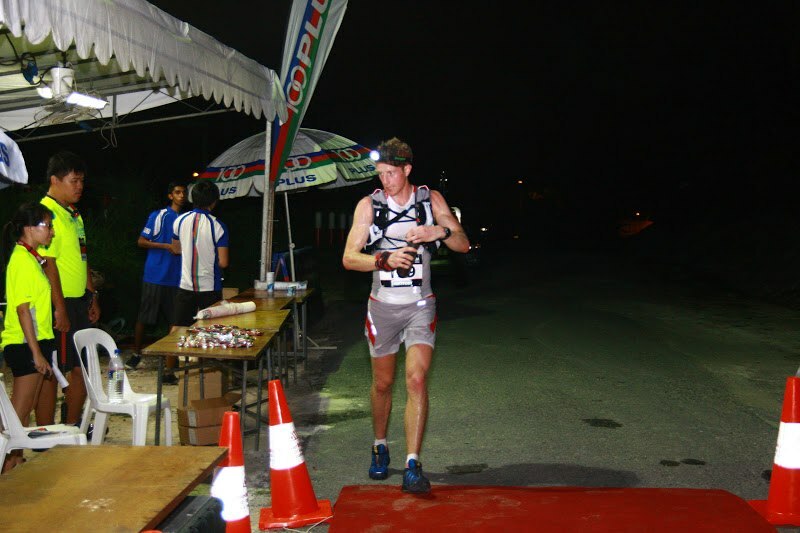 Arriving at Macritchie at 10pm, there was clear signage pointing to the start area, and most areas were well lit. It really was great to see lots of new faces and some very familiar ones at the 100km tent, an awesome turnout of 88 runners from all over the world getting ready to run. We all busy ourselves with prepping our bags, getting weighed in, catching up with friends and finally rocking up to the startline. 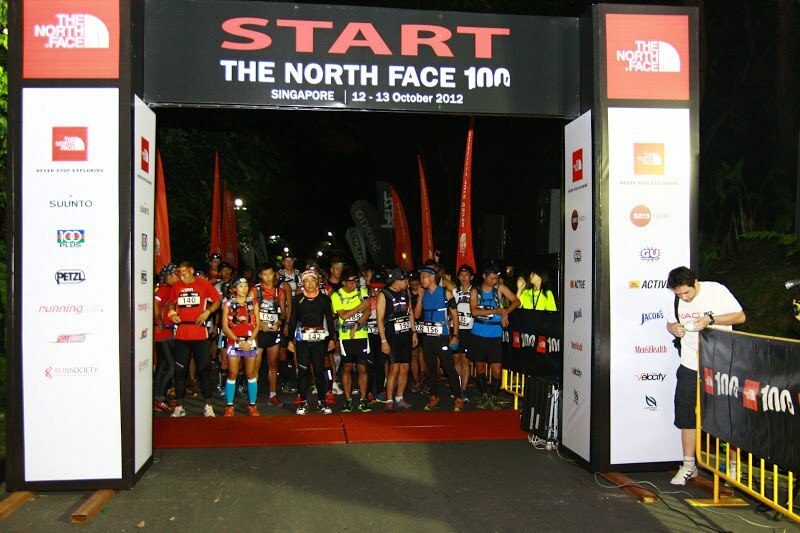 The gun goes off, and at 11pm on the night of Friday 12th, the 100km runners of the 2012 TNF100 Singapore are off. The boys at the front are already at a pretty quick pace, no doubt spurred on by the long, easy strides of Ricky Lightfoot, from the Salomon Trail Team. 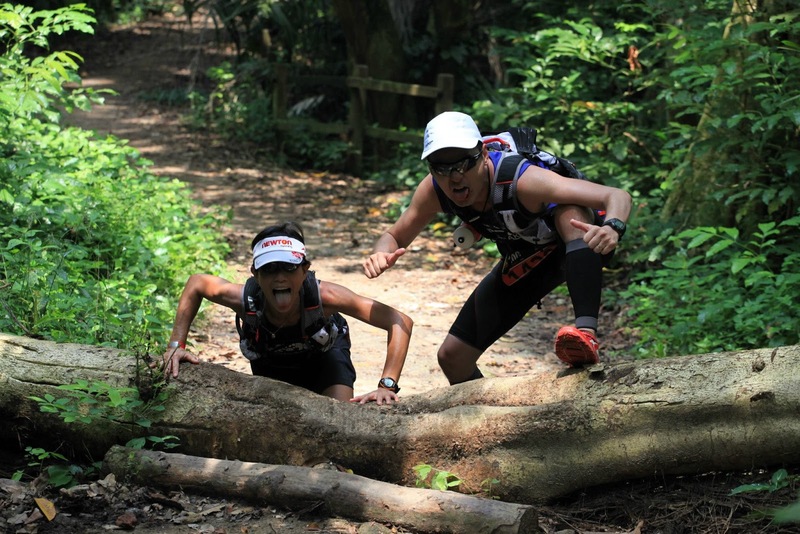 About 1km into the trail, I’m joined by Jimmy Tee, winner and new course record holder of the recent TMBT. Jimmy and I have a nice chat for the next few kms, and we’re joined by Matt from Sydney at about 4kms. At this point I’m slightly disconcerted that I’m running way too fast for a 100km race (but it was fun! ), and also plagued by major headlamp envy … my Black Diamond Storm didn’t seem to be emitting much light at all, but running with Jimmy and Matt (who had a headlamp and super bright handheld torch) was like running with my personal floodlights! 🙂 Somewhere along Rifle Range Road I realise I have my headlamp on the ‘sidelights’ setting (doh!) and I turn it to ‘full beam’ .. tadaaah! My world is bright again! I’m passed by a few runners including Henry and Eugene, and pick up a companion just before the Mandai Orchid loop in the form of Francis. We run the loop in the wrong direction (my fault), meeting Jimmy, Matt and Sam in the opposite direction, as well as Henry and a couple of guys from China and HK. Getting into Lorong Asrama, I see Ricky speeding out as he yells some encouragement … the man is a monster! Didn’t see any of the other frontrunners and soon I’m alone again as Francis takes off. The Asrama loop felt much longer than I thought it would be. 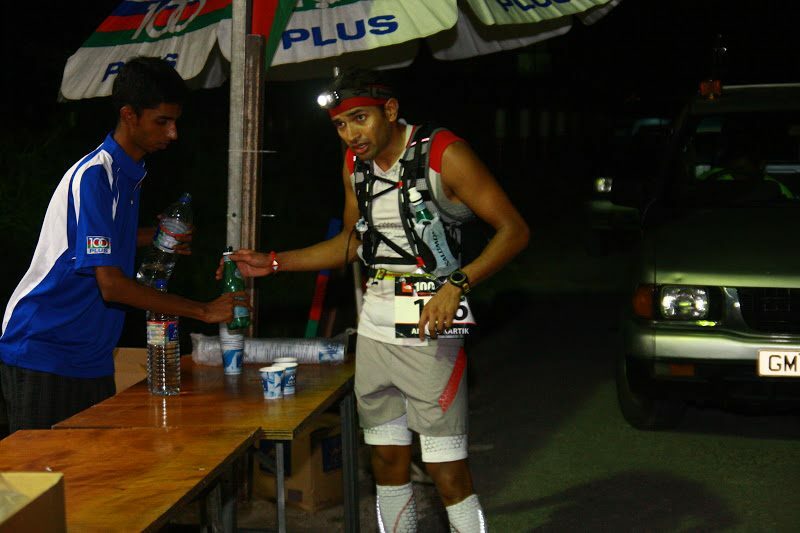 A quick refill at the water point and it’s back out on the road for the return leg. At about 35km I’m starting to feel pretty tired .. eyes closing, legs heavy and fighting sleep. I’m starting to pay for a fast first 30km, and looking forward to some Red Bull at the 50km station. I picked up two companions along the way .. Kin from HK and Jianzhong from China. I inevitably end up running with some sprightly older men in ultras .. just so happens I run at ‘old man’ pace! ;P These two were hilarious and great company .. it was like listening to ‘chicken and duck talk’! My Mandarin is atrocious and my Cantonese non-existent .. and these two didn’t speak English but we were enthusiastically trying to converse the whole way! They did make some very strange noises though, lots of coughing, seriously heavy breathing and top-notch hawker uncle-style throat clearing throughout! One of them (not naming names!) let rip the loudest three-part fart on a quiet stretch and scared the living daylights out of me. 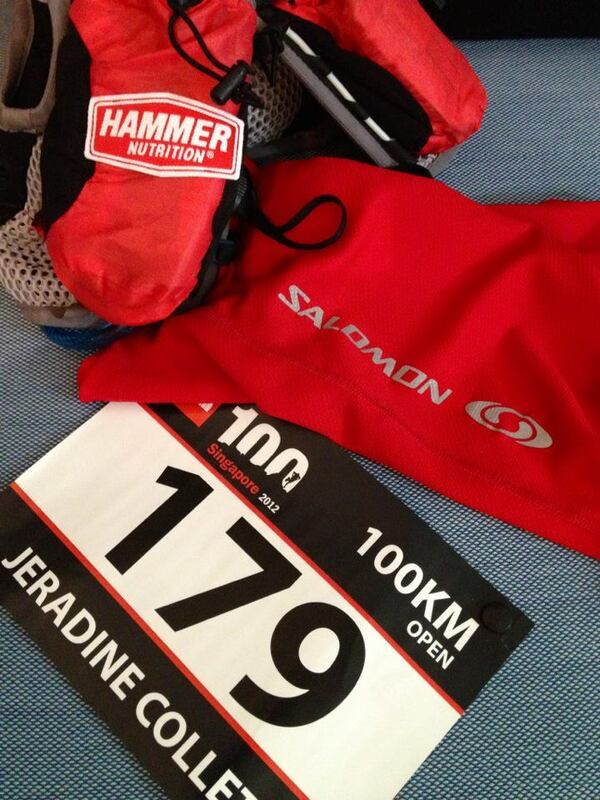 Nonetheless, we all made it to the 50km tent in about 5:47h and spent a couple of minutes sorting ourselves out. I downed half a bottle of Red Bull and put the other half in my pack. Exchanged greetings with Henry S. who was sat down trying to regroup, replaced my Perpertuem flask, put Oakleys and a visor in my pack and got ready to head out. Kin and JZ both decided to come with me, and our noisy little trio headed out into the dark for our second loop. I’m revived by the lights and Red Bull infusion at the 50km checkpoint, and we’re making good speed, albeit slower than the first loop. I’m hoping to get in under 13 hours, and JZ is already suggesting that we all hold hands for our photo finish! Kin is a 3:10 marathoner and JZ about 3:45, both of them very chipper and looking strong. I stick my foot between some rocks in the Kampong trail, and nearly go head over heels, but luckily managed to stay upright and carry on. My shin and ankle really hurt, but I take a leaf out of Cliff Young‘s book – he once said the doctor’s told him he had arthritis in his joints so he decided to ‘run it out’ (a strategy which appeared to work!). At this point there’s pain emanating from everywhere and my theory has always been that it’ll hurt the same regardless of if I’m walking or running, so I might as well just run. When we get to Dairy Farm Road, my regular swig of Perpetuem is rudely rejected and everything comes spewing out. Uh oh. Not sure what happened so I take another swig and immediately throw up. one last try to swallow some food is met with the same effect. Not good! I run to catch up with Kin and JZ who have ambled on ahead. Lucky for me the Dairy Farm aid station wasn’t far away and they had bananas. I grab one, take a few bites and pray it all stays down. The banana seems fine and we all carry on running again. I see Eugene just after Zhenghua Park, sat down on a bench and looking pretty ill. Kenneth, his brother and another friend are looking worried for him, saying he’s feeling pretty rough. I offer him a sour plum, hoping it’ll help with the nausea, wish him luck and carry on. By this time our trio is starting to stretch out a little, and I’m having to deal with my Perpetuem puking issues. At Lorong Asrama for the second time, I attempt a Hammer gel just before the aid station. Just manage to get a small gulp down my throat before it all comes rushing back up again. Ugh. Ok, looks like I’ll have rely on bananas from now on as all I have are gels and Perpetuem. I briefly contemplate not having anything for the rest of the run, but there’s 30kms to go and not a viable option at this point. I’m on my own inside the Asrama loop, passed by Mark, Lexus and Regis about halfway in, on their way to podium finishes in the 50km event. My shin/ankle is killing me, my feet feel blistered, and I’m starving. 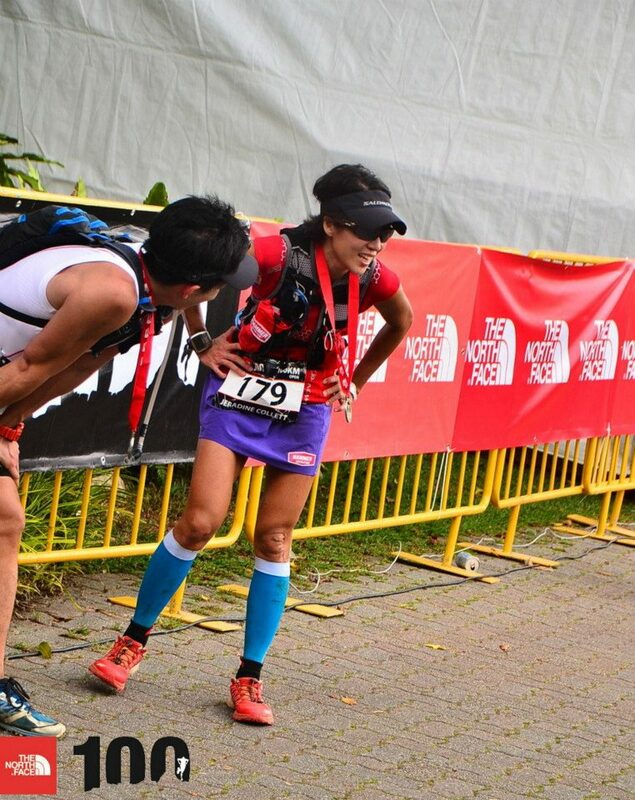 Ah, the joys of ultramarathons! 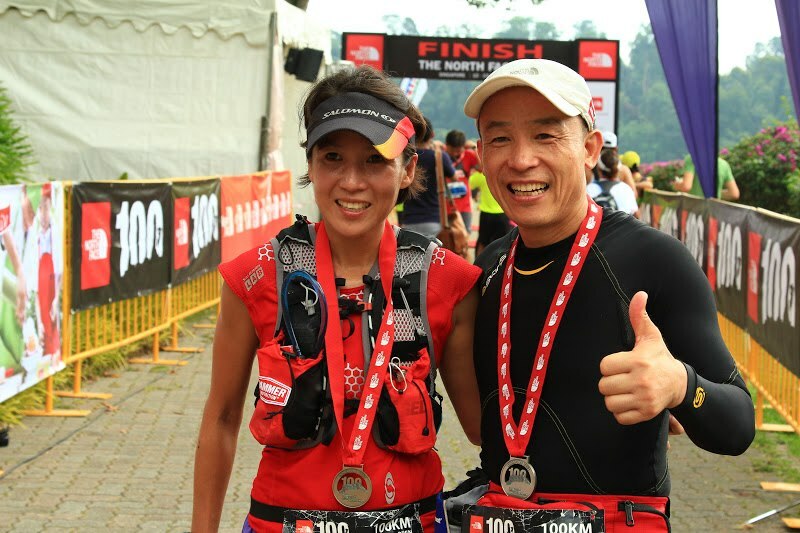 Coming out of the Asrama loop, I see more 50km runners including the insanely chirpy Angelina and Randall, who make me laugh with their enthusiastic greetings. On the way back, I feel mentally energised knowing it’s the home stretch (albeit a loooong one! ), and try to offer some encouragement to the runners I meet along the way. There were far too many to mention, but it was so good to see all of you on your own highs and lows, battling it out to test your limits. Thanks for all the encouragement in return, seeing other runners along the way always gives me a boost! I surprised to see Ash just before the hill up to Zhenghua Park (he started the 100km yesterday with us), but he ignores my questions and hand me a life-saving box of raisins instead (still having issues with Perpetuem). He’s so chirpy and encouraging, and that really was one of the highs in the race. There were 5 or 6 mountain bikers sat across the road, all of whom suddenly went “5, 6, 7, 8, 9, 10! Only 10km more to go! Go! Go! 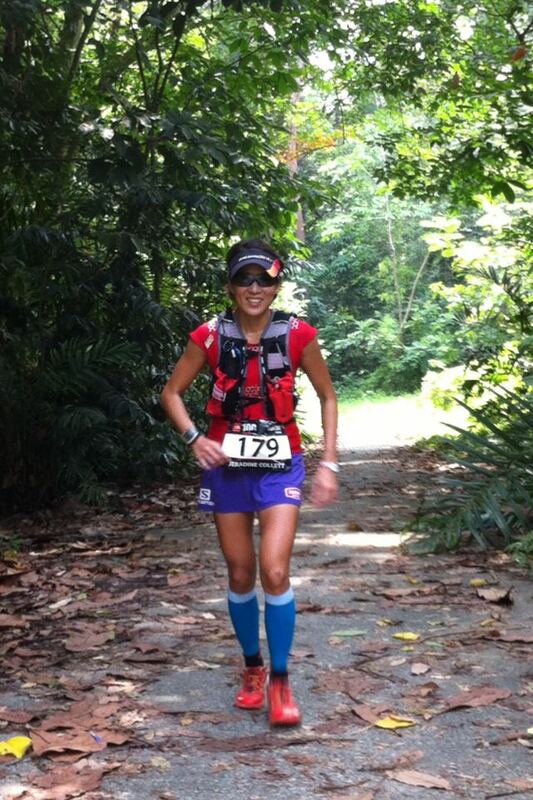 Go!” That was such a funny moment and cheered me up no end as I head up the hill to Zhenghua. 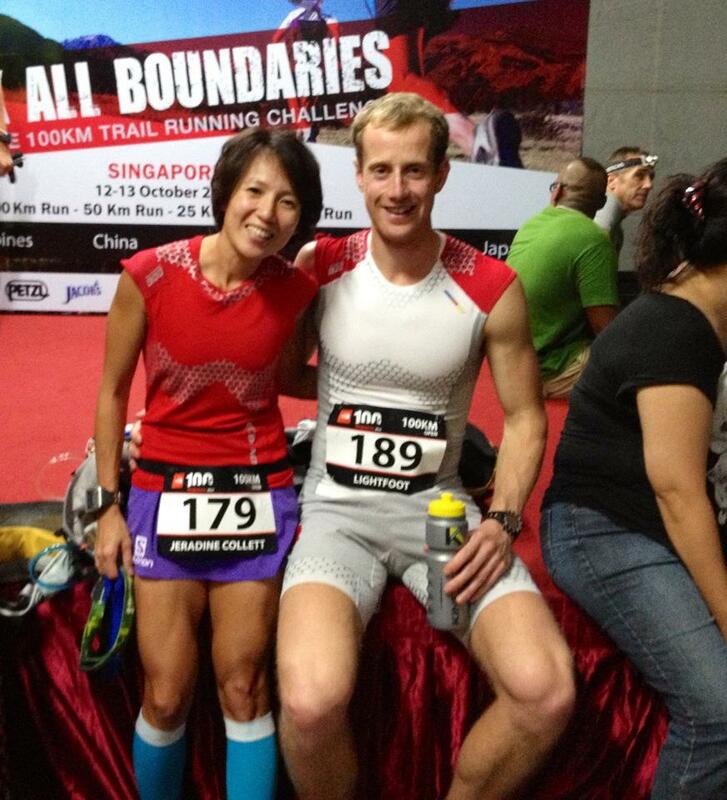 Matt the Aussie is at Zhenghua, having succumbed to heat and chafing, so I pass him my BodyGlide and say I’ll get it off him at the finish. Yaoming comes blazing past just before Dairy Farm, and Jasmine zips by at the end of Rifle Range Road on her way to a first place finish in the 50km event. 200m back on the trail and I trip and go flying downhill. Some lovely runners in the 25km event help me up and I’m off again. The last 7kms I have to dig deep, I really haven’t got much left, with pain and fatigue all conspiring to tempt me to just walk. I’m trying to make 13hrs, and it looks very iffy. Henry S. comes past and we run together for a bit before I have to slow down again. 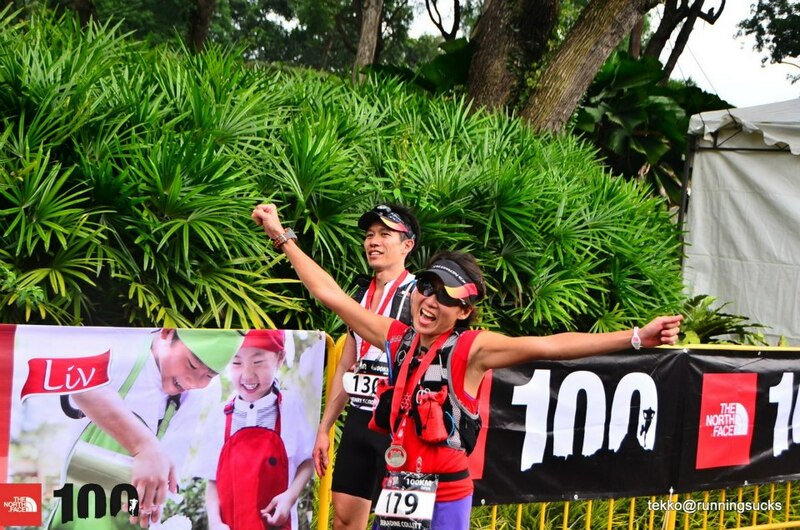 Finally the adrenaline kicks in with 700m to go, and I finally make it over the line in 12:56:21, and first woman in the 100km event. Could’ve been better, but then again it could’ve been a lot worse. 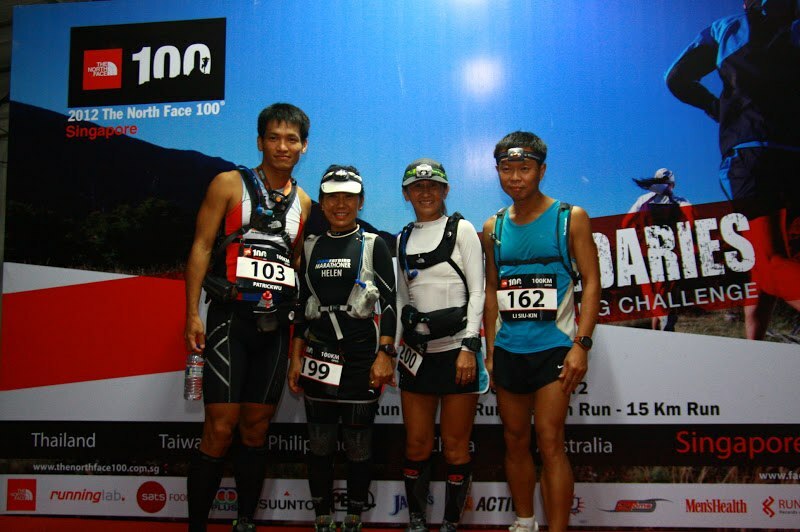 There are always improvements that can be made, but I’m truly glad that TNF100 this year was an event we can be proud of. I enjoyed every rollercoaster moment!